Map of Algeria, Tunis, and Morocco. This is a beautiful example of Rand McNally and Company's 1891 map of northwest Africa. Featuring Algeria, Morocco and Tunisia, it covers from the Mediterranean Sea to the Sahara. Two inset maps in the upper left quadrant feature Algiers and Tunis. After its conquest by the French in 1830, Algeria became an attractive destination for European immigrants. However the majority indigenous Muslim population was dissatisfied with the political system. This dissatisfaction would ultimately trigger the Algerian War and lead to Algeria's independence from France. 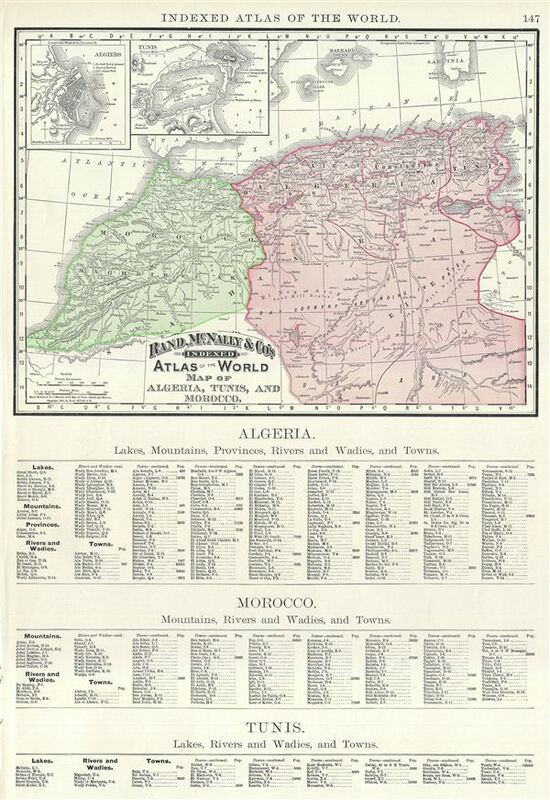 This map of Algeria, Morocco and Tunis, printed on half the page unlike most other maps from this atlas, contains a list of islands, lakes, mountains, rivers, towns, etc. in the lower half of the page, below the printed map. Color coded according to regions, the map notes several towns, cities, rivers, mountains, and various other topographical details with relief shown by hachure. This map was issued as plate no. 147 in the 1895 issue of Rand McNally and Company's Indexed Atlas of the World - possibly the finest atlas Rand McNally ever issued. Very good. Text on verso and at bottom of page, below map. Rumsey 3565.039 (1897 edition). Philip (atlases) 1026 (1898 edition).